Doesn’t it seem like bad things happen all at once? We ask this question all the time: Why me? Why do bad things happen to good people? Sometimes, Satan is at work. Hurt people hurt people, and free choice allows evil people to do evil things for a season. Sometimes God doesn’t cause something, but he allows it to let us grow or to use it for good. There are several reasons described in Scripture and more that we just don’t understand. Our world is really broken, and it’s okay to say that some things are just too much for me to understand. But I’ve been thinking about this question while going through a study of 1 Samuel (I’m using the Undivided study guide by Stephanie Smith…review coming soon!). 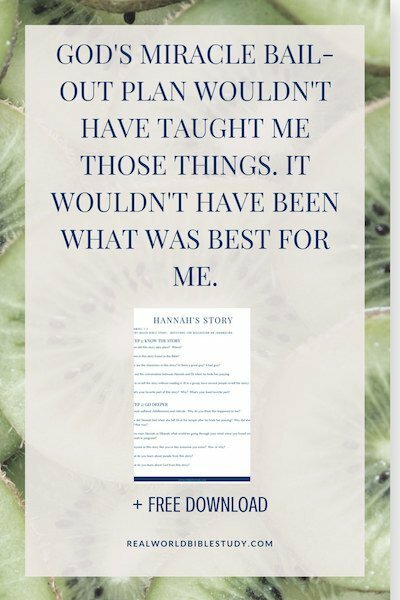 Hannah’s story really spoke to me about one of the reasons bad things happen to good people. I’d like to share that story with you today. This blog post comes from a story-based Bible study, where we use all the fundamental rules of interpretation, but talk about the story in a storytelling format. It’s a little different from a 3 point sermon! 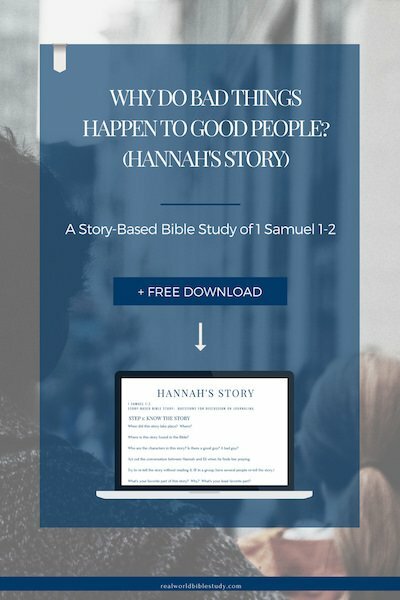 If you want to try out story-based Bible study for yourself, you can download a list of discussion questions for Hannah’s story below. You can watch the video or read the story below. This story takes place in ancient Israel, during the time of the judges. So this is several generations after the Israelite people came to the Promised Land, but before they had a king. Now at this time, there was a certain man whose name was Elkanah. He was from the tribe of Ephraim. Elkanah was a good and righteous man; he lived the way God wanted him to, and he loved his wife Hannah very much. But Hannah couldn’t have children. The Bible says God kept her from conceiving. In those days, “an Israelite woman had to produce a baby. If she could not, she was regarded as less than a woman.”  Children were your insurance policy, your retirement plan, your status, and the way your name carried on after your death. It was such a big deal that in those days, Elkanah could have divorced Hannah and married someone else so that he could have children. But he didn’t. He loved her and stayed married to her. Finally, she convinced him to at least take a second wife so that he could have children (in that time, that was an accepted thing to do). So Elkanah married Penninah, and she had children, but still, Hannah did not. Every year this man would leave his town to worship and sacrifice to God in Shiloh. Whenever he sacrificed, Elkanah would give parts of the sacrifice to his wife Peninnah and to all her sons and daughters. But he would give only one part of it to Hannah, even though he loved her, because she didn’t have any children to share it with. And because the Lord had kept Hannah from conceiving, Penninah became her rival and would make fun of her mercilessly, just to bother her. (Because when bad things happen, they don’t seem to come one at a time!) And this happened year after year after year. Whenever Hannah went to God’s house to worship with her family, Peninnah would make fun of her. Then Hannah would cry and she wouldn’t eat anything. I bet she kept wondering why! Why do these bad things happen to me? As she kept praying before God, the priest Eli watched her mouth. Now, Hannah was praying in her heart; her lips were moving, but her voice was silent, so Eli thought she was drunk. I mean, after all, people didn’t really pray silently back then, and she had just come from a festival where people were drinking and partying! “Please think well of me, your servant,” Hannah said. Then she went on her way, ate some food, and wasn’t sad any longer. When it was time for Elkanah’s family to go up to make the annual sacrifice, Hannah didn’t go with them this time. 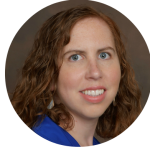 “Do what seems best to you,” said her husband Elkanah. “Stay here until you’ve weaned him. But may the Lord bring to pass what you’ve promised.” So Hannah stayed home and nursed her son until she had weaned him. When he had been weaned and was still very young, probably about three or four years old, Hannah took him, along with a three-year-old bull, some flour, and a jar of wine, and brought him to the Lord’s house at Shiloh. They offered the bull as a sacrifice, then brought the boy to Eli the priest. Then Hannah and Elkanah worshipped there before the Lord, and then they left young Samuel in the care of Eli the priest and returned home. But her job as “mom” wasn’t over. Every year, Hannah would make a small robe for little Samuel and take it to him when she went up with her husband to offer the annual sacrifice. Eli would bless Elkanah and Hannah, saying: “May the Lord replace the child of this woman that you gave back to the Lord.” Then they would return home. The Lord paid attention to Hannah, and she conceived and gave birth to three sons and two daughters. Meanwhile, the boy Samuel grew up in the Lord’s service. And the story doesn’t stop there! Young Samuel goes on to become the prophet and judge that rules over Israel until the people for a king. Then he’s the one who God uses to choose the first king of Israel (Saul) and the next king, David! He may have even written part of what we call the book of 1 Samuel! Hannah’s precious “miracle baby” ushers in a new era for Israel and the world. 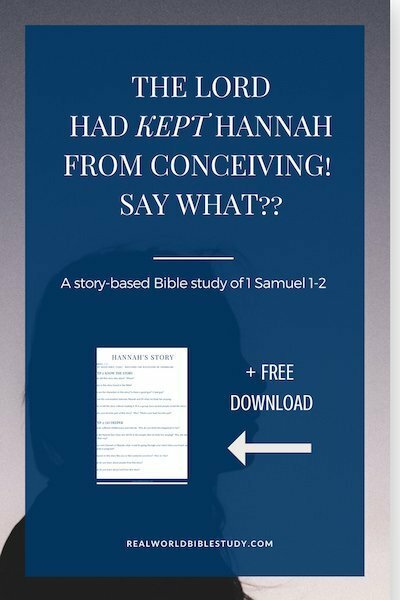 The Lord had Kept Hannah From Conceiving! By the way, this direct-act-of-God thing isn’t the only reason bad things happen. After all, we serve a good God. Scripture shows many reasons bad things happen, so we don’t want to misinterpret Old Testament stories by forgetting to keep in mind the rest of God’s word! But God’s plan wasn’t for Hannah to be childless forever. He had 6 children in her future, one of whom would become a great prophet and leader! Hannah didn’t know any of this at the time. It just hurt. So I’m thinking…when I’m hurting, what’s God doing? Because he sees the big picture. He knows how the story ends, and how this BIG DEAL right now will look in comparison to the rest of the story. And he took care of her even in her grief, giving her a loving, godly husband who stood by her when the rest of society would have told him to divorce her. This last year I really struggled with depression and anxiety. It seemed like a lot of bad things happen in life right on top of each other! And sometimes I would think, “why me?” or “why is this happening?” (Well, why not me?). God got me through it, and I know my relationship with God has grown so much in different ways through this season. God could have miraculously lifted the wool from my eyes, but he knew that wasn’t really what I needed. I won’t make a blanket statement about this for someone else, but for me, I needed to learn the things I learned in that season. I needed to learn to rely on God in a new way. I needed to learn to use the Armor of God I had been trained in my whole life, that was getting dusty on the shelf. I needed to learn how to serve people that struggle with mental illness. I needed to be able to put my arms around a middle school girl and say “I’ve been there.” I needed to learn the discipline of self-care, both physical and spiritual. God’s miracle bail-out plan wouldn’t have taught me those things; it wouldn’t have been what was best for me. And I was just thinking, he didn’t exclude himself from this either! Jesus came to the earth, and we needed a savior who “got it.” God already “got it,” but he was willing to let his son go through all the ridicule and then all the pain of crucifixion, for God’s greater plan…for us. So am I better than Jesus? God sure let bad things happen to Jesus because he loved YOU and ME so much. Wow. If he went through far worse than me to show love to God’s people, well, that gives me some perspective. When bad things happen, it is okay to hurt and grieve. Hannah sure did! Even Jesus did! But now, I’m also trying to look for God’s fingerprints. How is God taking care of me in the middle of this bad thing? And then I look to the future. God, what are you going to do with this mess? 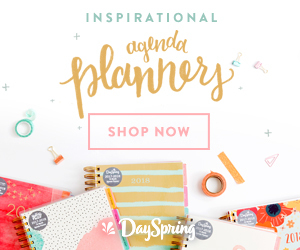 What really cool thing do you have planned? I don’t get it now, I don’t see it, but I know you’ve got something! I would love to hear about something in YOUR story that hurt, maybe something bad that happened, that God used to bring about something really really great! Let me know in the comments below! And if you want more of Hannah’s story, download my discussion questions for this story using the form below! The CEB Storytellers Bible. (Nashville, Tennessee: Common English Bible, 2017), 377. Louis Ginzberg et al., The Legends of the Jews (Philadelphia: Jewish Publication Society of America, 1909), VI, 215–16. The CEB Storytellers Bible., 377. Ronald Youngblood, “Hannah (Person),” David Noel Freedman, The Anchor Yale Bible Dictionary (New Haven, Conn. ; Yale University Press, 2008), 51. 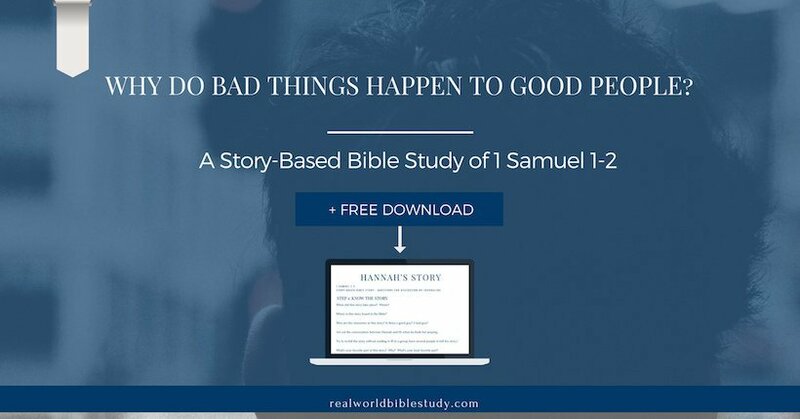 1 and 2 Samuel were written anonymously, but traditionally they have been attributed to the prophets Samuel, Gad, and Nathan. Paul S. Evans, Tremper Longman, and Scot McKnight, 1-2 Samuel, The Story of God Bible Commentary (Grand Rapids, Michingan: Zondervan, 2018), 20. Donald. Stamps, Fire Bible: Global Study Edition., New international version. (Hendrickson Pub, 2010), 455.